The MCG Uplift Foundation began as Eric Schroeder’s dream. Eric is a young guy who opened Mortgage Capital Group five years ago. As part of his business policy, Eric is committed to giving back to the community. Eric started the non for profit MCG Uplift Foundation to achieve this goal. Click on the image below to see a short 3 minute video where Eric explains in his own words why he started the MCG Uplift Foundation. Once a quarter, through the MCG Uplift Foundation, Eric allocates funds for causes his employees have choosen. This summer Eric rented a hot air balloon complete with a pilot. Together, they are working with the chosen causes to use the balloon to raise money for each of the selected organizations. Many of the causes are small and local like the Algonquin Red Dress Run, Animal House Shelter in Huntley, Crystal Lake South Gators Baseball, It’s All About Kids, Home of the Sparrow, A Friend in Deed and more. 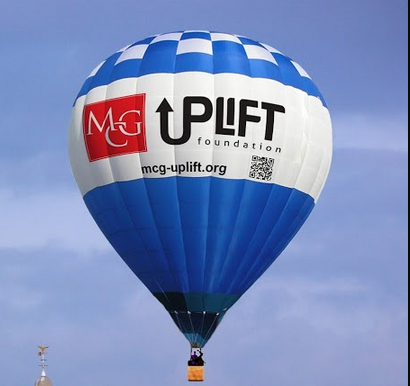 This summer, watch for the MCG Uplift Foundation balloon as they sail over the Crystal Lake, Algonquin, Lake in the Hills, Elgin and Richmond areas. The balloon is schedule to fly sunset cruises on these dates, weather permitting. The balloon will sail additional dates. Keep watch as they fly over the area a wave hello when you see them. On some of these rides, the balloon will land and lucky spectators will get a chance to go up in a tethered ride in the MCG Uplift Foundation balloon.